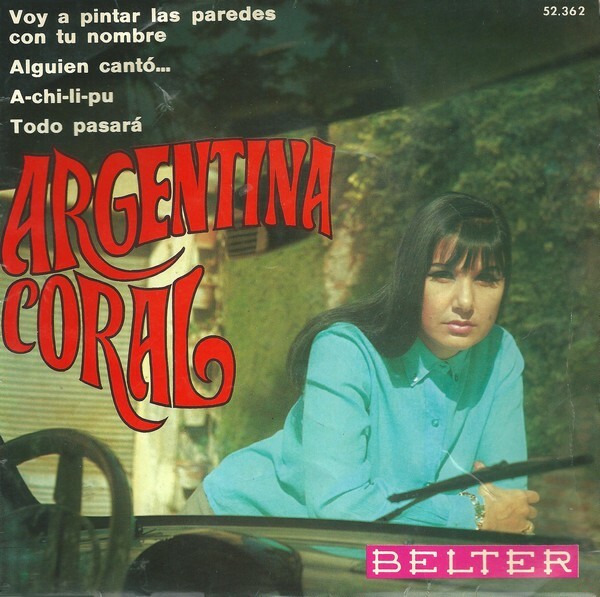 Don’t Cry For Me, Argentina Coral. Your Eyeliner Will Run. 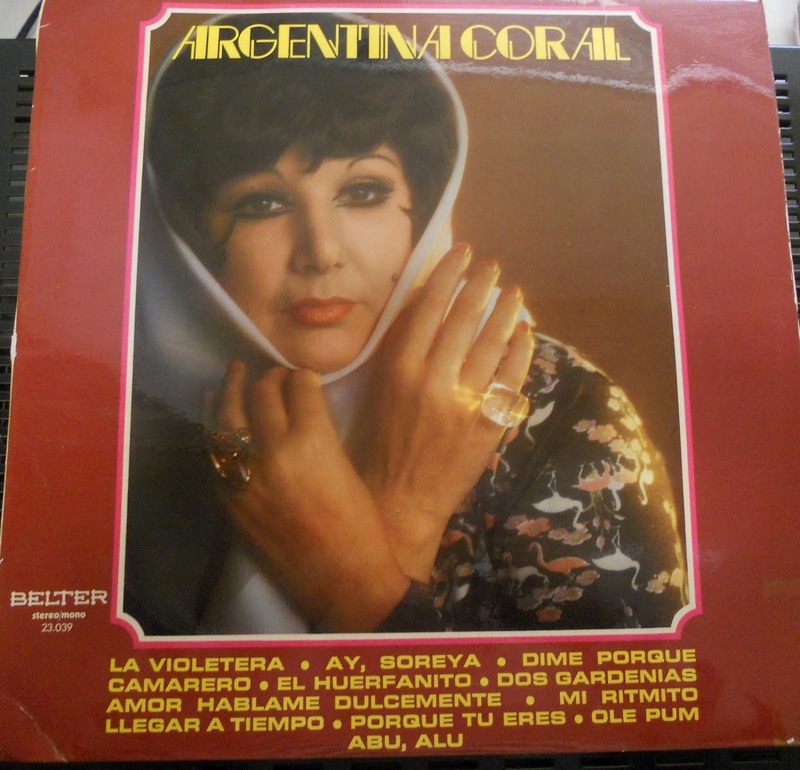 Just take a moment to really take in all that is Argentina Coral. That’s it. Deep breath. Before noon today, I had never heard of her, nor seen her. But now I have. Now we both have. 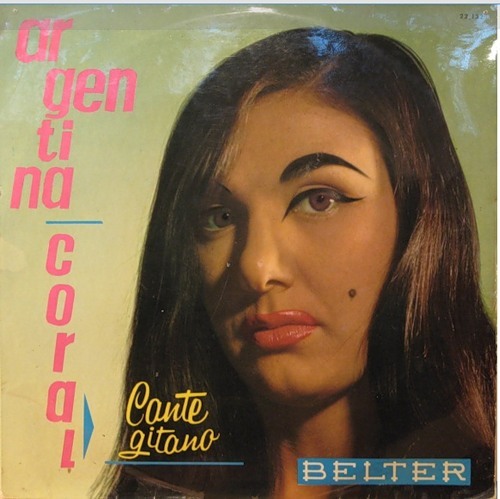 The name of this LP is Cante Gitano, which means Gypsy Singing. A looser translation might mean “emitting a fetid smell,” because her facial expression reveals something putrid this way comes, and it’s not just flamenco music. Now I consider myself fairly musically-savvy, and I have seen enough of Stevie Nicks singing “Gypsy” to know that it entails white lace and prairie skirts, along with dizzy spinning in front of a mirror to catch one’s reflection, perhaps reassess one’s perm. But just to be sure, I rewatched the video. I was correct, but had failed to remember the ring-around-the-rosie scenes in a nymph-filled forest while it rained sequins and Tinkerbell dust. Nonetheless, this is not what Cante Gitano offers. Far from it. In this bar I first saw you, and without thinking I gave you my whole life. This offer bar with beer, amid sadness and pain. This bar opened our souls, and delicious phrases said. In this bar so many things happened, so I always come to this corner. Pour me a glass of rum and drink your beer with my heart, you are the steward of my love ..
Hell hath no fury like Argentina scorned. But time passed, and it softened her. She traded her swoosh eyebrows for thin arcs, her turquoise blouse for a raincoat adorned with upside-down birds. Alas, we all grow old. Now fly like your inverted flamingos and go to that corner of your favorite bar and drink rum with the steward of your love and say delicious phrases. Sing “Amor Hablame Dulcemente,” and he will sing sweetly to you and your mole. And maybe, just maybe, he will buy you another cubic zirconia pinky ring for the other hand to deflect bullets like you are some sort of Latina Wonder Woman. Adios, Argentina. Adios. Next Now is ze time on Sprockets vhen ve dance!